Governor Snyder is attempting to resuscitate his reputation by benevolently raising your taxes. Our ace Governor is not going quietly into the night as his governorship slides into the twilight zone. He launched two tax proposals last week which he touted as environmental initiatives. Neither raises enough funds to even remotely achieve his stated environmental objectives, unless the taxes he proposed skyrocket in the future. Both proposals are actually designed to expand our hopelessly inept (and periodically corrupt) bureaucracy. The environmental angle is just eyewash to sell higher taxes to the gullible. And those tax rates he proposes will skyrocket – bet on it. First up is an increase in the current landfill tipping tax from $ 0.36 per ton to $ 4.75 per ton. 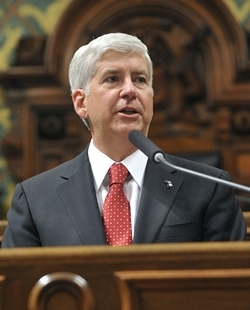 Snyder claims this tax increase will raise $ 79 million for recycling programs. It won’t. The incremental revenue will be something less than $ 70.7 million, because 769,000 tons of solid waste from other states with lower tipping taxes will no longer be land filled in Michigan (pdf). Michigan landfills will suffer a 4.5% volume drop, which will be consequential. They will either curtail operations (read: lay off workers), cut workers’ wages or raises, and/or adjust tipping fees. Local units of government, which also collect revenue from their landfills, will suffer revenue losses as well. Environmentalists will applaud, but the trash is just being diverted to different land fills. There is no environmental benefit to playing musical chairs with garbage. Governor Snyder implies in his press release that his proposed tipping tax increase will diminish Michigan’s solid waste imports from his Canadian buddies; the ones who are building his bridge. It won’t. Ontario landfill tipping fees start at $ 75 CAD per metric ton ($ 55 USD per short ton). Comparable Michigan landfill tipping fees are in the low $ 30 USD range. Snyder would have to raise the Michigan tipping tax by $ 25 USD, not the $ 4.39 he proposes, to materially reduce Canadian solid waste exports to Michigan. Keep in mind that the Canadians will ignore their transportation costs; they need to feed tolls to that fancy new bridge as cross border truck traffic otherwise declines. Our Canadian neighbors didn’t pay for the Gordie Howe Bridge out of the goodness of their hearts. It was cheaper politically than opening land fills. A tipping tax which would actually impact Canadian trash exports would wipe out Michigan land fills and their workers. And all of our solid waste would be exported to other states, making Michigan many new friends across the Midwest. Yet tipping tax proponents will imply that the tipping tax increase will curtail Canadian trash exports to Michigan. The Detroit Water & Sewerage Department’s Non Residential Drainage Rate became a political hot potato in 2013 when the City finally started applying this breathtaking, disguised tax to all non residential properties within the City. Mayor Duggan is scraping the bottom of the barrel for every revenue dollar he can find. Prior to 2013, the City of Detroit only extracted this rate from 12,000 non residential property owners, although 41,237 non residential property owners should have been paying it. They also extracted this rate from the State of Michigan and Wayne County for roads in Detroit, after a lengthy appeals process which ended in the U.S. Sixth Circuit Court of Appeals. Detroit shielded politically preferred and connected property owners from this tax for 35 years, notably the politically powerful black churches. But that ended in 2013 when the City of Detroit “discovered….that there are some errors with respect to our billing of stormwater charges”. This rate, which is often referred to as a stormwater fee or the rain tax, is not inconsequential. It is now $ 660 – $ 750 per acre, per month. Run of the mill churches with on site parking were rudely surprised with $ 3,500 monthly charges in 2015, on top of their already expensive water bills. They thought as religious entities they were tax exempt. Tee-hee. No one in Michigan is truly tax exempt! Michigan Public Act 178 of 1939 (MCL 123.161 et seq.) converts unpaid DW&SD stormwater fees into a property lien, same as unpaid property taxes, so these fees quickly result in property foreclosures. Ever wonder why Detroit has such a problem with commercial property blight? Now church blight is in the offing. Non residential property owners in Detroit have just received a legal notice in the mail announcing a proposed settlement of a Wayne County Circuit Court class action case filed by Michigan Warehousing Group LLC and Midwest Valve and Fitting Company against the Detroit Water & Sewerage Department over the DW&SD’s outrageous stormwater fee. This case is identified in the Wayne County Circuit Court as 15-010165-CZ. The parties reached a settlement agreement which is carefully constructed to cripple legal challenges to the constitutionality of the stormwater fee in higher courts and handsomely pay off the trial bar. The settlement notice fails to inform non residential property owners that another, far more comprehensive class action law suit is progressing in the Michigan Court of Appeals. Detroit Alliance Against The Rain Tax v. City Of Detroit in the Michigan Court of Appeals, Case Number 339176, just got consolidated with a similar suit on 24 October and appears ready for litigation – also as a class action.